Aquitaine, lying on the southwest of the country, is the largest region in France, with a 200 km west coast running to the Spanish border. The diversity of what Aquitaine has to offer can be seen from its unique Basques country, from the vineyards of Bordeaux and from the ancient caves of Lascaux. Aquitaine is well known for its rich heritage and a tradition of warmth and hospitality. It is therefore very popular with both, foreign and French people/tourists. The place is particularly ideal during the hot and sunny weather (maybe add months, so readers know when that is). When it was under the Romans, Aquitaine is believed to have extended even up to the River Loire. From the 10th to the 12th century, the counts of Poitiers held the title ‘Duke of counts of Aquitaine’. In 1137, the province went to France, by the marriage of the Duchess Eleanor of counts of Aquitaine with Louis VII of France. When they divorced in 1152, the region came under the English control by Eleanor taking Henry II of England as her new husband. With strong links between Aquitaine and England, trade flourished. Large quantities of French wine was exported to London, Southampton and other English ports. The region was again brought under French control after the Hundred Years War which ended in 1453. The region was called Guyenne until the French Revolution. 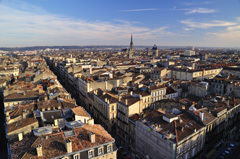 The historical relevance of the region is perhaps in the fact that Bordeaux has witnessed a transfer of power three times. The region welcomed the Prussian French and the governments after the two world wars. With a population of close to 3 million, the region accounts for 5% of the French population. You will be surprised to know that about 1 million people in Aquitaine are foreigners. The cosmopolitan city of Bordeaux is on the west bank of the river Garonne. It was previously a notable seaport, but its prominence fell after the Second World War. Today the city is bustling with activity and industries. Wealthy vineyard owners, students and large North African immigrant communities rub shoulders in the city. The battleship tour of Croiseur Colbert takes one around the battle ship lying docked at Quai des Chartons. Theater performances are held at the Grand Theater, the oldest wooden framed theater in Europe. Biarritz and Saint Jean-de-Luz are prominent Basque towns, which are also established surfing spots in France. Biarritz town shot to fame when the Empress Eugenie, wife of Napoleon, was so engrossed with the Basque country that she built a palace on the beach in the mid 19th century. It was here that surfing was introduced to France, and nowadays the Biarritz surfing festival draws surfers from various countries. The cosmopolitan town has splendid beaches and golf courses. Close to the seaside resort of Biarritz is the city of Bayonne, which literarily means ‘good river’. Bayonne city itself is small, but very pleasant with its half-timbered houses and its riverside buildings with green and red shutters. The city of Pau is famous for excellent views and flowers. When the English discovered Pau in the 19th century, they introduced fox hunting, golf, croquet and beautiful parks. With the introduction of railways, writers, artists and musicians took refuge here in search of inspiration. Victor Hugo, and Stendhal are among the prominent personalities who settled in Pau. The 16th century Pau castle or Chateau de Pau is the birthplace of King Henry IV. His cradle can still be seen here. The castle also houses the National Museum of Pau which has a great collection of tapestries from the 16th to the 18th centuries. The cities of Domme and Monpazier have kept their medieval period look, with roads in the form of a grid, surrounding the market square. Some Aquitaine towns are part of prominent pilgrimage trips like the Road to Compostela or the Way of Saint James. Although Aquitaine is popular for golfing and surfing, it has plenty more to offer, from the mountains to the ocean. Apart from the innumerable sporting and relaxation activites on offer, the region of Aquitaine provides year-round entertainment through great festivals, zoos and parks. The Le Musee Aquarium in Arcachon and ‘Requins et Poissons exotiques’ museum in Bayonne are very interesting, particularly the one in Bayonne which has sharks and other exotic fishes. Among the notable Aquitaine towns (Dordogne is a départment which is something like a province, from my understanding, so ‘town’ isprobably not the best word here. I am not sure if you would like to use départment or an equivalent in English.) are Dordogne which has Monpazier, one of the most beautiful bastides in Europe; Gironde with its villages of Bordeaux and Saint Emilion, popular for monolithic churches and medieval streets. Lot et Garonne has a beautiful castle in the rural village of Montastruc. The départment of Landes has the village of Dax, which is popular for spa and baths, as well as being an important site for Gallo Roman archeology. North Dordogne is the site of the ancient caves of Lascaux famous for their Paleolithic wall paintings of early man. Adventure-seeking youths discovered the remarkable ancient paintings in the caves in1940. The paintings are estimated to be about 15,000 years old. These are now protected and not open for public view. An exact replica, cave of Lascaux II, is now open to visitors, however, and is a major tourist attraction.